Canada has been, and continues to be, home to some very solid gospel choirs. The Montreal Jubilation Gospel Choir, the Quebec Celebration Gospel Choir, and Sharon Riley & Faith Chorale are a few that come to mind. 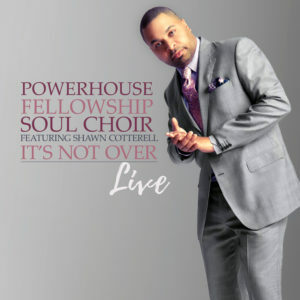 Here’s another: from the greater Toronto area comes the Powerhouse Fellowship Soul Choir. It was formed, like many mass choirs, for a specific program or purpose, but in 1988, two years after its birth, it became an official entity under its director and founder, Shawn Cotterell. Since then the group has provided vocal support to popular and religious artists, and garnered awards of its own along the way. It’s Not Over, a live offering, finds the choir living up to its name. It offers rhythm-and-praise arrangements and open-throated harmonies supported by brassy musical backing. While “I Choose to Rejoice” is the designated single, “The Sweetest Name,” a tender and melodic selection with the soul of an old hymn, gives it a run for its money in unfettered spirituality. The live audience, generally hard to discern on the album, jolts into earshot and appears to concur, as the song stimulates an unscripted prayer moment. “Perfect Peace,” actually a cover of “Perfect Praise” (aka “How Excellent”) by Walt Whitman and the Soul Children of Chicago, finds Patricia Shirley assuming the late Lecresia Campbell’s lead role. She pays homage to Campbell with a few flirty flights into high falsetto. The choir does a remarkable job on this gospel choir classic, and even gives the climactic coda a little bounce of its own manufacture. “Unexpected Gift,” rendered by R&B Canadian Idol finalist Toya Alexis, has a pop sensibility. Alexis teases the audience with occasional vocal scatting. Three of the songs, “I Choose to Rejoice,” the smooth and hypnotic “Angels Cry,” and “The Remedy” appeared initially on a 2015 EP, also called It’s Not Over. True to its name, the full album rolled out in 2018. ‘The Remedy,” the most straight-outta-hip-hop selection on the collection, concludes the album with the three featured soloists—Larmond, Alexis, and Shirley—returning to solo. It’s the most radio-friendly of the bunch. Like many non-U.S. gospel choirs, the lyric focus for Powerhouse is on vertical praise instead of succor to the suffering, though “The Remedy” is an exception. Some of the songs sound pitched too high for the soloists, but they rise to the occasion. The album’s overall feel is part Love Fellowship and part Brooklyn Tab—equal helpings of sacred silk and gospel grit.